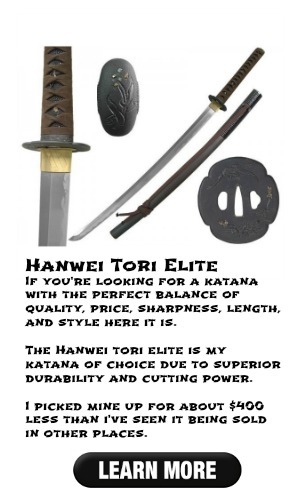 Searching for advice on katanas? You came to the right place. Finding katanas for sale can be a strenuous process or at least so I came to think during my first purchase of a katana. There are a wide array of options available to you, many of which to a newcomer, look vary similar causing confusion around what to buy. A simple Google search for ‘katanas’ or ‘samurai swords’ will yield an overload of search results, some helpful, some not so much. Katanas have long had historical significance (as you can see from my article on the history of the samurai sword) as well as numerous Hollywood debuts in movies such as Kill Bill, The Last Samurai, 47 Ronin, and many others. What is the best katana? Well, I created this site to act as a guide in helping fellow swordsmen (and women) find out which katana is right for them, how to size it, and some great places to buy one. I also recently added a forum section to the site so readers can interact with one another to talk martial arts and other topics related to katanas. Yes there are other sites out there that go much more in depth which is good, in some cases. However for the instances where you are looking for some basic quick information those sites may not be so great since informaiton is usually buried. My objective was to create a guide that gives newcomers an overview of understanding the katana sword and how to chose one for the purposes of practicing Iaido. Iaido is one of many Japanese martial arts that involves the use of katanas in its practicing. This is the sport I am partial to. It involves using smooth controlled movements to sheath and unsheathe a katana sword to react to an attack. You don’t actually battle another opponent in this art form but instead imagine the enemy and swing and defend yourself as if you actually were in battle. I enjoy this sport due to the ability to use my imagination to create a fight in my mind as opposed to reacting to what a real opponent may do. My interest in katanas was sparked by a simple anime show when I was younger and has turned into a more serious martial art fueled by working with a sensei to help me understand the power of these weapons. At first I thought I’d just buy a katana and ‘have fun with it’, I quickly learned that this is a serious sport and should not be taken lightly since I was in control of what could be a deadly weapon if used improperly. My first sword I went on the cheaper side of things thinking I could get a high quality katana without coughing up any reasonable amount of money. I went to Amazon, searched for katana, filtered lowest price to highest and just picked something near the top of my search results that didn’t appear to be a toy. While I waited for the sword to ship I got a hold of some bamboo sticks to use for cutting. When the katana arrived it looked decent and was great for a few days until a failed attempt at cutting a small piece of that bamboo ended in with my sword in two pieces. There must have been some defect in the core of the blade itself because having katanas break like that isn’t a normal thing from what I heard from those I talked to about this incident. Not only was I upset that I wasted my money but on the more serious side of things I could have seriously been injured had my hands been placed in a different position. This incident left my sword separated at the handle and me feeling pretty upset and actually quite embarrassed to be honest. Now don’t let my rare occurance scare you away from your interests in bladed martial arts however I can tell you that as a result of this incident I did learn my lesson with buying cheap that day. Because of this experience I highly recommend spending the extra cash to get something that will last. After my experiences, I’d rather spend more money once and have it last, than multiple amounts in increments of $100-$150 and have them break or not hold a sharp edge. Before we start the first section of the Katana Readiness Guide lets do a responsibility readiness assessment by acknowledging the following bullet points and making a conscious effort to abide by them. Only if you can agree to each of these then you are ready to start your path to getting one of the most significant pieces of Japanese weaponry in history, the katana. Great, now that we agree on those terms lets start with the first step, understanding the weapon you are about to purchase. So my gakusei, let’s now check out the types of katana swords to determine what type of steel you’d prefer for the sword. Already know all this? Go straight to buying a katana!